Open Windows 8 Mail on your computer. Bring up the Windows 8 Charms bar and click Settings. You can bring up the Windows 8 charms bar by hovering your mouse in the top or bottom right corner of the screen or by pressing Windows key+C. 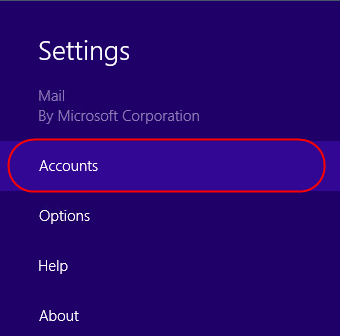 The Settings window will now appear, click Accounts. From the Accounts list, select the mailbox you want to enable SSL on. 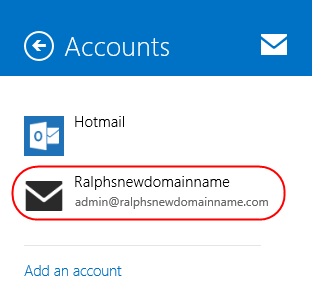 Incoming email server: Set this to mail.livemail.co.uk. Incoming Port: Set this to 993 for IMAP or 995 for POP. Server requires SSL: Tick this box. 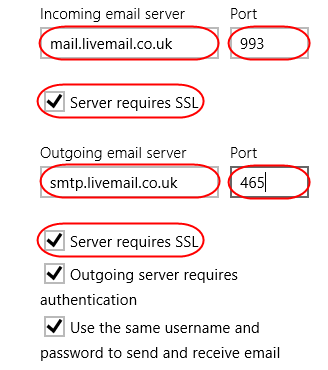 Outgoing (SMTP) email server: Set this to smtp.livemail.co.uk. Exit the settings by clicking elsewhere on screen, your mailbox will now be configured to use SSL.